The forearm contains two bones, the radius and the ulna. The radius and the ulna are long, slightly curved bones that lie parallel from the elbow, where they articulate with the humerus, to the wrist, where they articulate with the carpals. The radius is located laterally, near the thumb, and the ulna medially, near the little finger. The radius and the ulna have a styloid process at the distal end; they are also attachment sites for many muscles. The radius is smaller than the ulna. radius: One of two forearm bones, it is located laterally to the ulna. ulna: One of two forearm bones, it is located medially to the radius. The forearm: The radius and ulna are the bones of the forearm. The forearm contains two bones—the radius and the ulna—that extend in parallel from the elbow, where they articulate with the humerus to the wrist, where they articulate with the carpals. The space between the two bones is spanned by the interosseous membrane. Anatomically, the ulna is located medially to the radius, placing it near the little finger. The ulna is slightly larger than the radius. The olecranon is a projection of bone that extends proximally from the ulna. The triceps brachii muscle attaches to the ulna superiorly. The cornoid process, together with the olecranon, forms the trochlear notch where it articulates with the trochlea of the humerus. Laterally to the trochlear notch lies the radial notch, which articulates with the head of the radius to form the proximal radioulnar joint. Immediately distal to the coronoid process is the tuberosity of ulna, to which the brachialis muscle attaches. 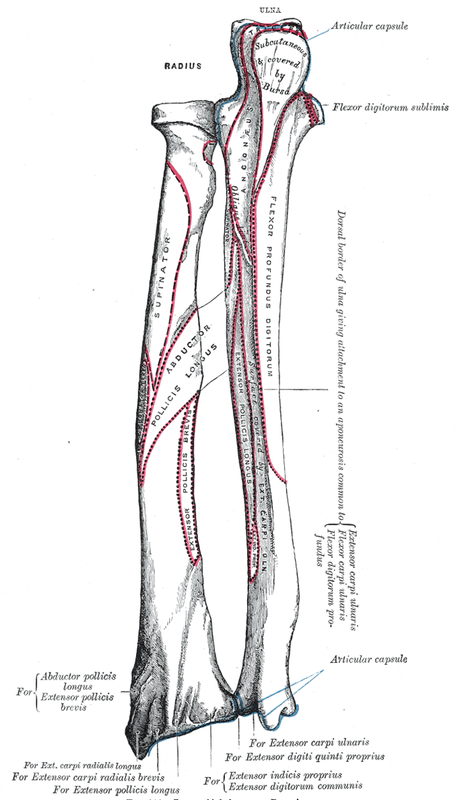 The shaft of the ulna is triangular and numerus muscles involved in pronation and flexion of the forearm attach to its surface. Distally, the ulna is much smaller and terminates with a rounded head that articulates with the ulnar notch of the radius to form the distal radioulnar joint. The styloid process of the ulna extends distally and is the site of attachment for ligaments found in the wrist. Anatomically, the radius is located laterally to the ulna placing it near the thumb. The radius is slightly smaller than the ulna and pivots around the ulna to produce movement at the proximal and distal radioulnar joints. Proximally, the radius terminates with a disk-shaped head that articulates with the capitulum of the humerus and the radial notch of the ulna. Immediately below the head lies the radial tuberosity to which the biceps brachii attaches. As with the ulna, the shaft of the radius is triangular in shape and numerous muscles, including the protonator teres, attach to it. Distally the radius expands, medially the ulnar notch articulates with the head of the ulnar. Immediately adjacent to the ulnar notch, the radius articulates with the scaphoid and lunate carpal bones to form part of the wrist.